The beautiful 215,000 hectares of Talampaya National Park are located in the southern area of La Rioja Province. 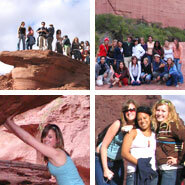 Its main attractive, the astonishing Talampaya Canyon gave name to our hotel. The reddish canyon walls reach 250 metres high, creating an impressive atmosphere for visitors. Traditionally, its oneiric shapes have inspired human imagination into naming different rocks after different items; for instance: the Monk, the Tower, the Gothic Cathedral, the Condor, and the Sphinx among many others. All you have to do is free your imagination and the rocky surroundings will come to life. Also exceptional, is the petroglyph legacy, an interesting series of rock engravings in the area, showing geometrical shapes, animals and strange human forms. It is because of this natural and cultural richness that Talampaya National Park is now a UNESCO World Heritage Site, where archaeologists have even found remains from the first dinosaurs of the Triassic period (250 million years ago). It is a real satisfaction, for the inhabitants of the Province of La Rioja, to act as hosts for all humankind at such a beautiful site, and our door is always open. Other tour options at Talampaya National Park are: Cañón Arco Iris (Rainbow Canyon), and Ciudad Perdida (Lost City).